Place of the Battle of Usagre: In South-Western Spain, 50 miles south-east of Badajoz. Combatants at the Battle of Usagre: British, Spanish and Portuguese cavalry against French cavalry. Commanders at the Battle of Usagre: The British, Spanish and Portuguese cavalry was commanded by Major General Lumley. The French cavalry was commanded by Major General Latour Maubourg. Size of the armies at the Battle of Usagre: General Lumley’s force of British, Spanish and Portuguese cavalry numbered 2,200 men of whom half were British. General Latour Maubourg commanded a French cavalry force of 3,000 men, comprising the brigades of Brigadier General Bron (4th, 20th and 26th Dragoons), Brigadier General Bouvier (14th, 17th and 27th Dragoons) and Brigadier General Briche (3 regiments of light cavalry). 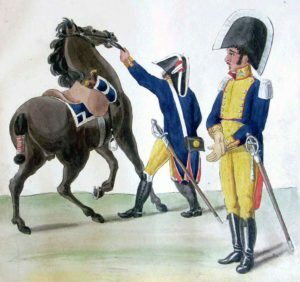 The British heavy cavalry was still wearing the cumbersome ‘side to side’ bicorne hat with scarlet coats and heavy riding boots. At Usagre the 13th Light Dragoons were still in the old style light blue, Light Dragoon uniforms, with the leather peaked helmet topped by a bearskin crest. 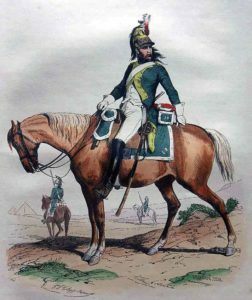 The French Dragoons were largely in green uniforms with Roman style helmets. French Hussars wore the conventional uniform worn by this arm across Europe. The British, Spanish and Portuguese won the battle decisively. In May 1811, Marshal Soult advanced from Andalusia in the south of Spain to relieve the French garrison in the important Spanish border city of Badajoz, under siege by Marshal Beresford’s army of British, Spanish and Portuguese troops. The attempt ended with Soult’s defeat by Beresford’s army at the Battle of Albuera on 16th May 1811. Following the Battle of Albuera, Marshal Soult retreated to the south-east, conveying the substantial number of casualties his army had suffered in the battle, while Beresford resumed the siege of Badajoz. Soult fell back through the towns of Almendrajo, Villafranca, Usagre to Llerena, followed up by Beresford’s troops. 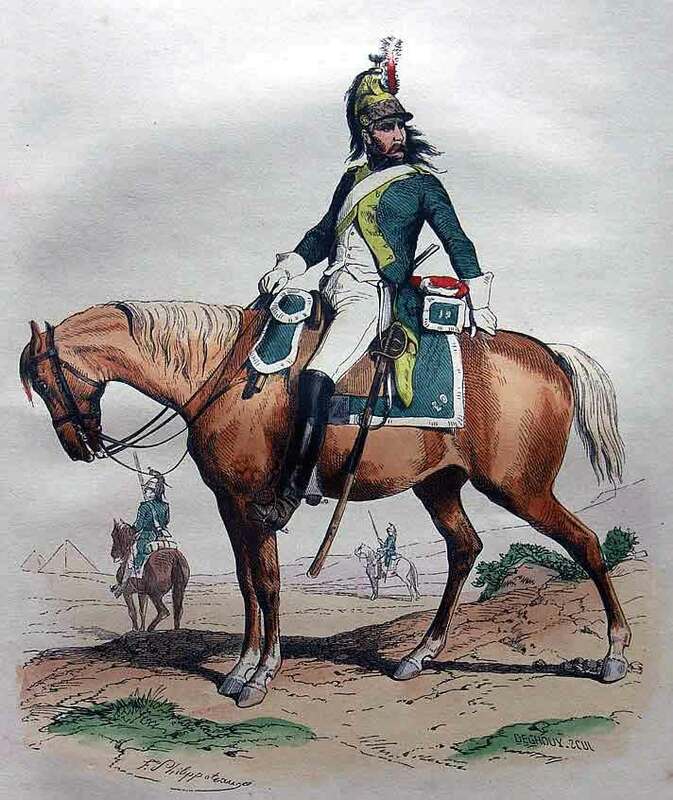 On 25th May 1811, Soult ordered Major General Latour Maubourg to march back and attack the forces following the French, to assess their strength and see if it was possible to make another effort to relieve Badajoz. Latour Maubourg’s force comprised 10 regiments of cavalry and a battery of field artillery, some 3,000 men. Latour Maubourg marched north-west up the Badajoz road for four miles, encountering Spanish troops at Villa Garcia. He pursued the Spanish back to the town of Usagre. 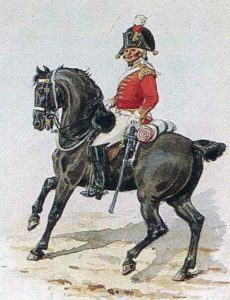 Beyond Usagre was the British and Portuguese cavalry division, now commanded by Major General Lumley, who had taken over the command from General Long. Lumley’s division comprised the British 3rd Dragoon Guards, the 4th Dragoons, the 13th Light Dragoons, the Portuguese 1st and 7th Cavalry Regiments and some weak Spanish regiments, 2,200 men, half of them British. Also with the division was Lefebure’s troop of Horse Artillery. The town of Usagre lies on the southern side of the Usagre River, which runs through a gorge with steep sides. 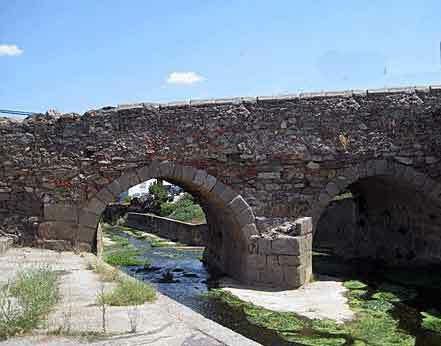 At the northern end of the town of Usagre, the Usagre River is approached by a narrow street and crossed by a bridge. The road on the northern side of the Usagre River goes into a narrow gorge in the hills that overlook the river and the town. 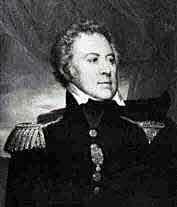 General Lumley, well informed as to the features of the area, identified crossing places, comprising dips in the steep river banks and fords, above and below the town of Usagre. General Lumley deployed his troops to meet the advancing French cavalry of Latour Maubourg. The 13th Light Dragoons crossed the river by the ford upstream of Usagre and Otway’s Portuguese regiments crossed by the ford downstream of the town. On the southern side of the town of Usagre, these two detachments formed line with the Spanish already positioned facing the advancing French. The French cavalry coming up, Latour Maubourg deployed his columns into line and brought up his battery, which opened fire from the high ground to the south-east of Usagre. 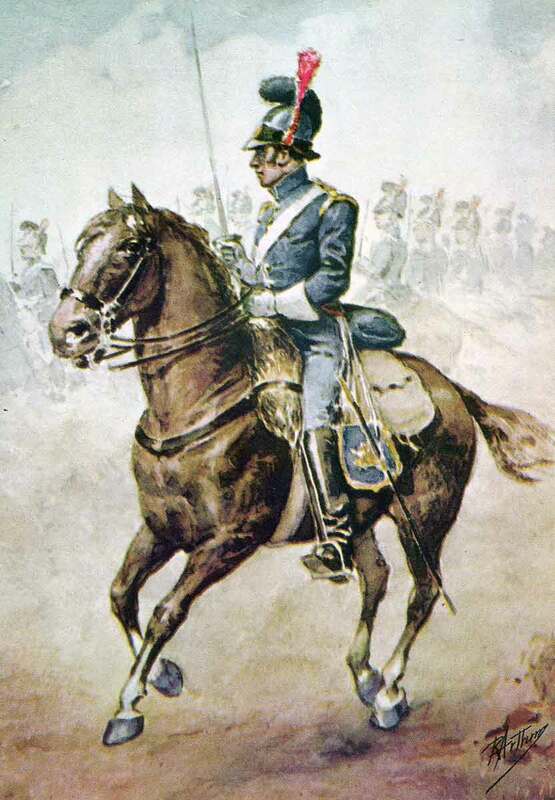 The line of 13th Light Dragoons, Spanish cavalry and Otway’s Portuguese regiments fell back before the advancing French cavalry. The Spanish passed through the centre of Usagre and crossed back over the bridge to the north bank, while the 13th Light Dragoons and Otway’s Portuguese cavalry recrossed by the two fords they had previously used and took up positions on the high ground immediately behind the two fords, the 13th downstream of the town and Otway’s Portuguese upstream of the town. General Lumley’s two heavy cavalry regiments, the 3rd Dragoons Guards and the 4th Dragoons were positioned behind the hill crest overlooking the river bridge. The fire of the French guns was met by a return fire from Lefebure’s horse artillery troop, which held its own, in spite of having fewer and smaller guns. While the guns exchanged shots, Latour Maubourg dispatched General Briche with 3 regiments of light cavalry, to march along the river, cross to the far bank by the downstream ford and attack the British positions on the far side of the bridge in the flank. Briche marched the mile or so to the downstream ford, to find Otway’s Portuguese cavalry in position at the top of the steep incline on the far bank, overlooking the ford. 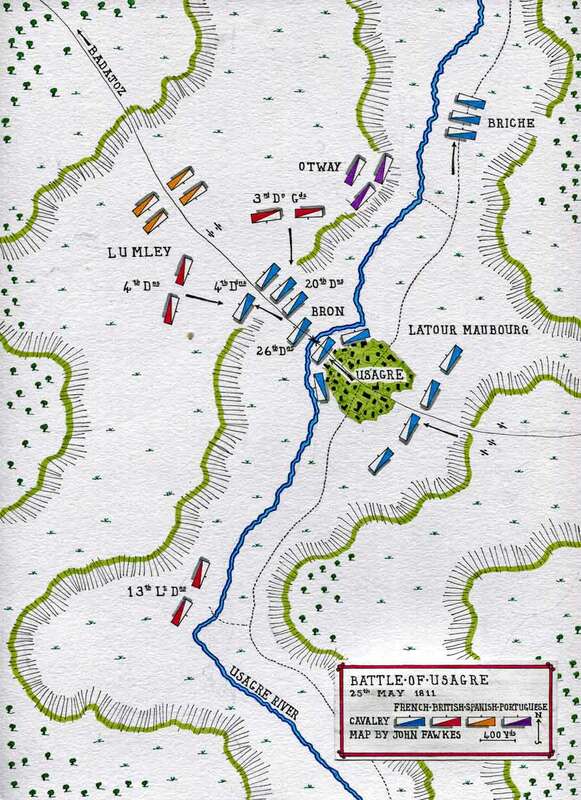 Reluctant to attempt an assault across the river in such circumstances, Briche continued his march along the river bank seeking an undefended crossing point, thereby missing the battle. After waiting in excess of an hour and not hearing from Briche, Latour Maubourg assumed that Briche was safely across the river and about to deliver his flanking assault on the British regiments on the far side of the bridge. Latour Maubourg ordered the commander of his leading cavalry brigade, General Bron, to cross the bridge and attack. General Bron led his 3 regiments of dragoons through the town of Usagre at a spanking pace and crossed the bridge, the 4th Dragoons leading. 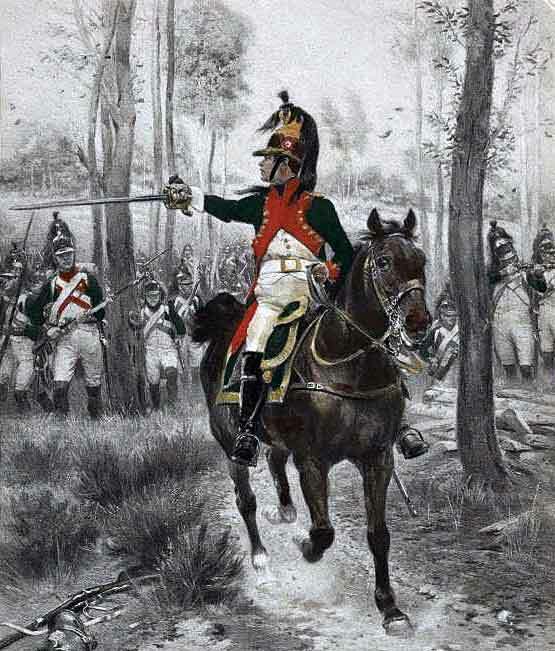 On the north side of the Usagre River, the leading French regiment, the 4th Dragoons, deployed into line and continued its advance, the second regiment, the 20th Dragoons, coming up behind still in column. 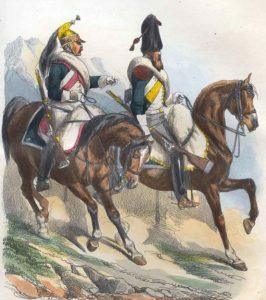 The British 3rd Dragoons Guards attacked the right flank of the French brigade, while the British 4th Dragoons attacked the left flank, both regiments charging over the crest of the ridge and downhill against the unprepared French dragoons. 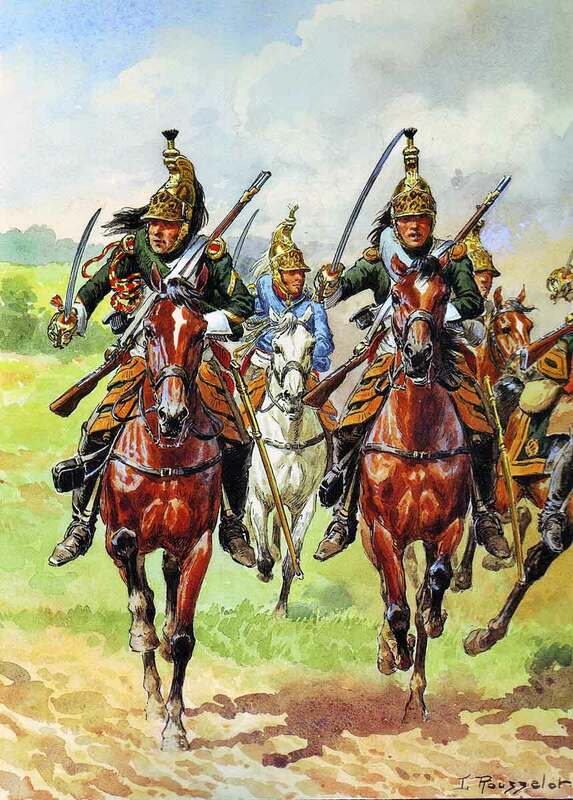 The 2 French dragoon regiments were overwhelmed and driven back to the bridge, where they met the third regiment of the brigade, the 26th Dragoons, still crossing the bridge and moving in the opposite direction. In the resulting confusion, the French troopers, many unable to cross back, were hunted along the bank of the river by the British, some abandoning their horses and plunging into the water to escape the pursuing cavalrymen. Latour Maubourg deployed another dragoon regiment on foot along the waterfront in the town to provide covering carbine fire in support of the regiments under attack, but with little effect. The survivors of Bron’s brigade finally made their way back across the river, bringing the battle to a close. French casualties were around 200 killed and wounded and around 100 officers and soldiers captured. The casualties of the British, Spanish and Portuguese were 20 killed and wounded. As a result of the battle, the river at Usagre became the demarcation line between the French and Allied armies, until Soult began his advance later in the year. 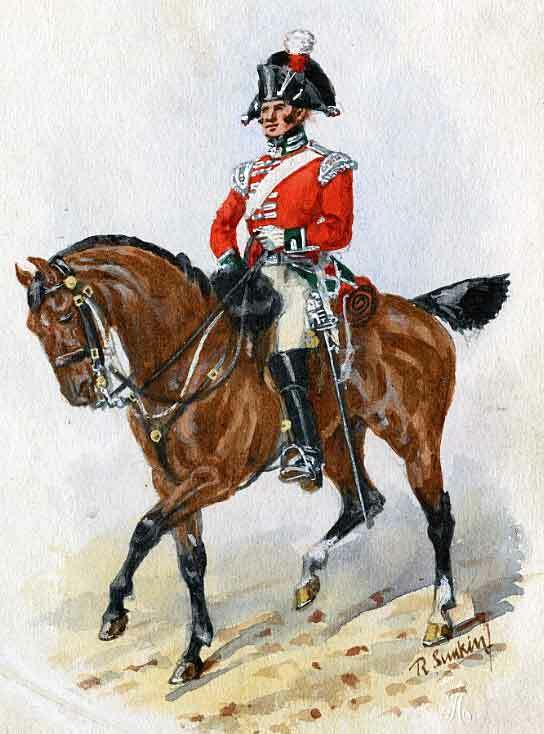 The 26th Dragoons, caught on the bridge during the Battle of Usagre, was the same regiment routed by the British 13th Light Dragoons at the Battle of Campo Maior.